Missouri River flooding near the border between Nebraska, Iowa, and Missouri. 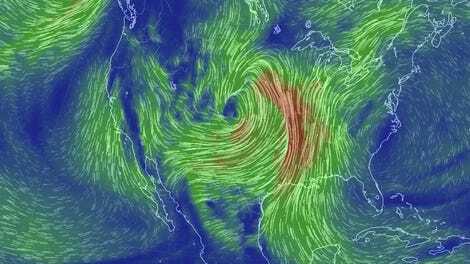 When last week’s bomb cyclone hit the Midwest, it was hard to imagine the inundation it could bring amid whiteout conditions and more than a foot of snow. But the warm weather that wrapped in behind it quickly melted out all that white stuff and unleashed historic flooding across parts of Nebraska, Iowa, South Dakota, Kansas, and Missouri. 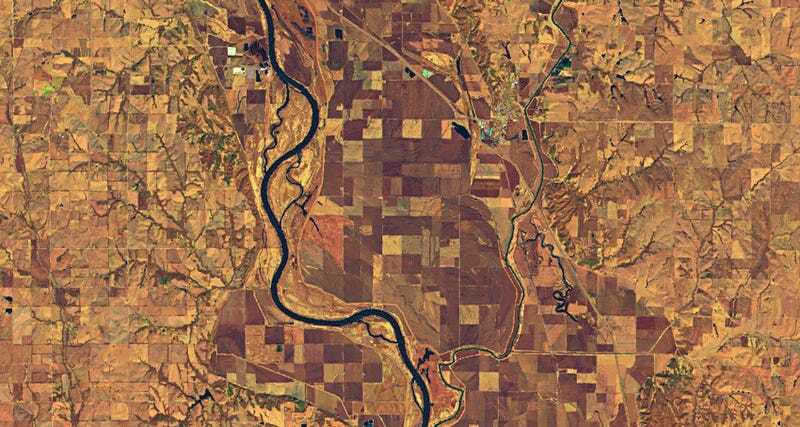 Floodwaters have worked their way down the rivers that run like arteries through the region, overtop the banks of the Missouri, Platte, Elkhorn, and more. Dams have been destroyed, bridges and other infrastructure have been washed away, and small towns have been cut off from the outside world, surrounded by moats of muddy water. 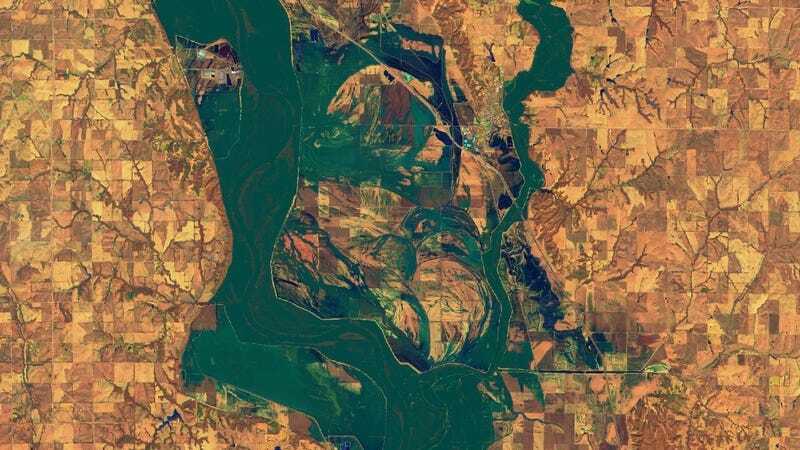 The flooding has also paralyzed the various military bases scattered across the region, with waters lapping up against Fort Leavenworth and Offutt Air Force Base, home U.S. Strategic Command. As Task and Purpose helpfully notes, that means the base that “oversees the Pentagon’s nuclear strategic deterrence and global strike capabilities” is largely underwater. The situation also neatly illustrates how climate change—which is leading to more intense precipitation—is a threat multiplier. As of Monday, nine flood gauges operated by the National Oceanic and Atmospheric Administration remained at major flood stage with another 17 in moderate flood stages. 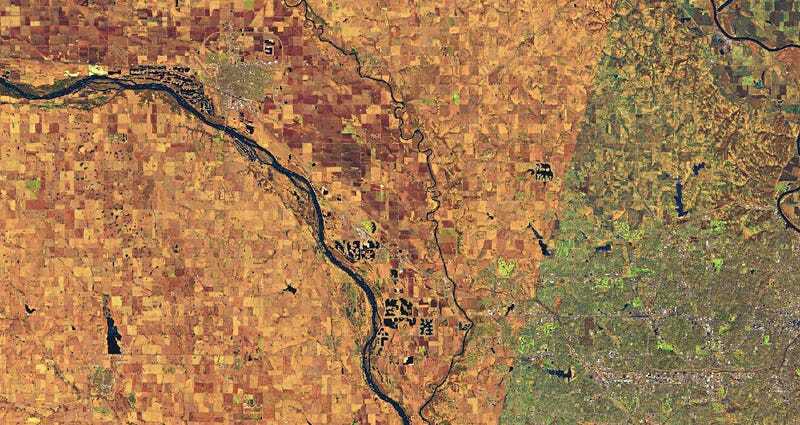 While the on-the-ground photos show the human toll of the floods, satellites are the best way to get a handle on the full scope of what’s happening in the Midwest. 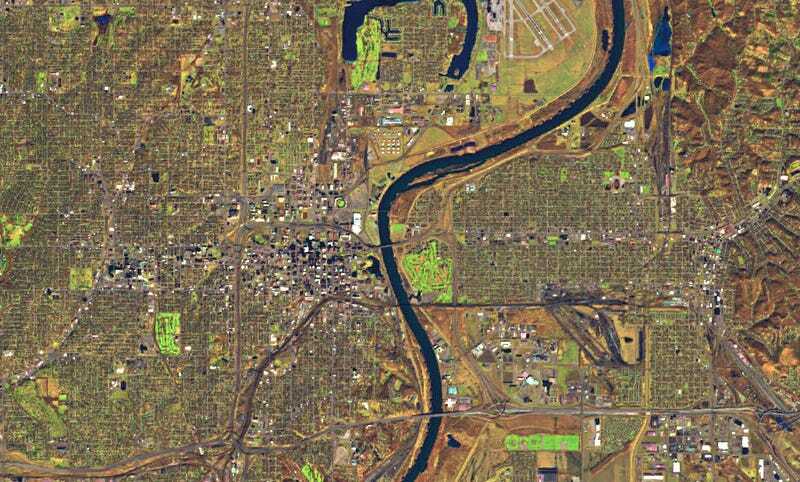 Below are before and after images captured by the European Space Agency’s Sentinel satellites. Where the Missouri (left) and Nishnabotna (right) rivers meet on the border of Iowa, Nebraska, and Missouri. The Missouri River snaking through Omaha. The Missouri River near Camp Ashland, a Nebraska National Guard training center. 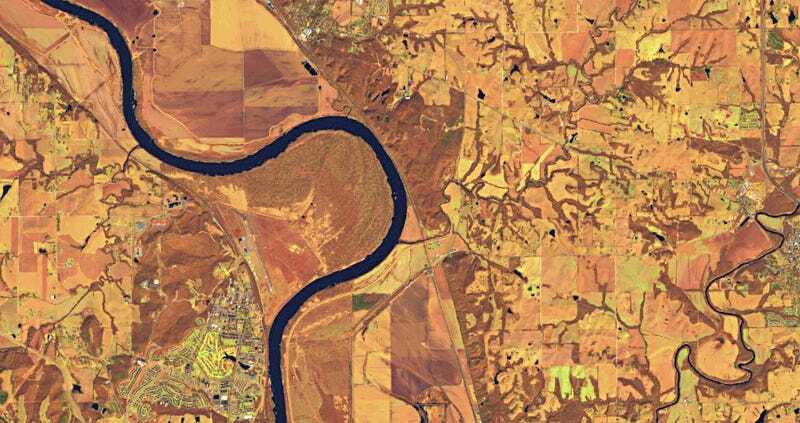 A view of Kansas’ Fort Leavenworth (lower and middle left), an army installation, on the banks of the Missouri River. 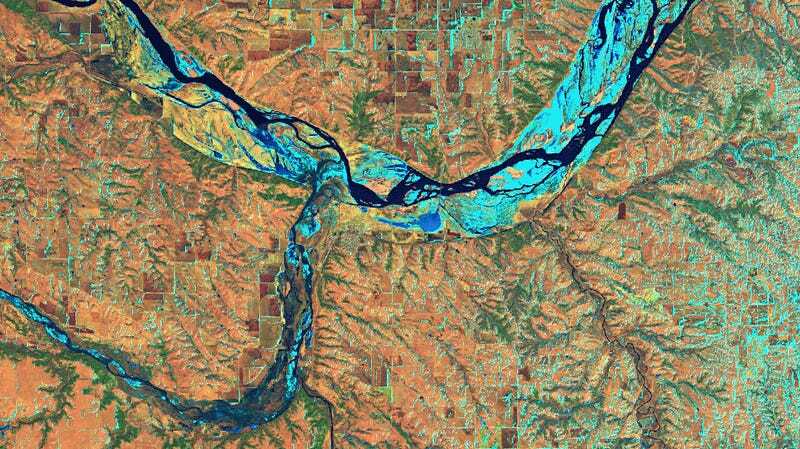 The convergence of the Elkhorn (left) and Platte (right) rivers in Nebraska. 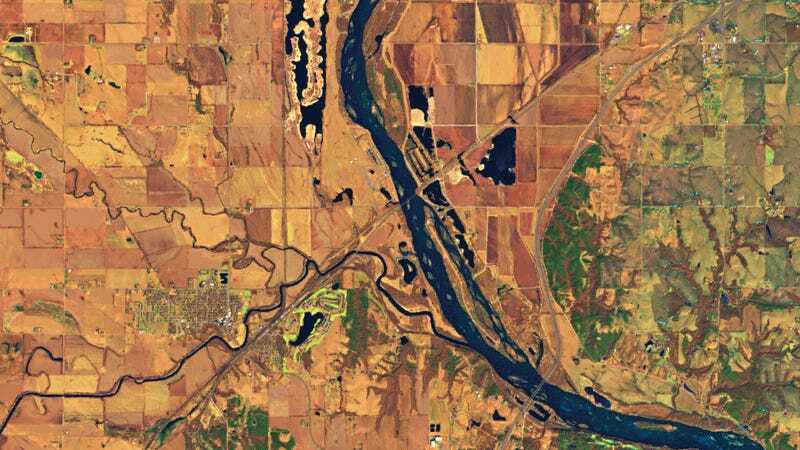 The confluence of the Missouri (upper) and Niobrara (lower left) rivers near Niobrara, Nebraska. One of the bridges into town was washed out by the floodwaters after a dam ruptured.